Apple's CEO, Steve Jobs, finally unveiled the Apple iPad during an event today. The name of the new tablet was revealed only a few days ago, and aims to separate itself from tablet computers such as Microsoft's new Slate PC category. Leaks have prepared us all for an "iPhone on steroids" and we recently estimated the release date to be April 2010. The "iPhone on steroids" has turned out to be a good description of the new Apple iPad, and the release date will indeed be April 2010. According to Steve Jobs, the reason for its existence is to beat both smartphones and laptops when it comes to the categories in bold throughout this story. Of course, with such a mission the Apple iPad will likely walk down the same road as the iPhone: Either you'll grow to love the Apple iPad, or you'll return it and hope that the netbook category will soon be offering optimized software and services too. The Safari browser on the Apple iPad is just as capable as the iPhone browser. Steve Jobs pitches it as a way to see the full page you're surfing on without zooming in and out, something you can obviously not do on the iPhone. There's of course also landscape and portrait mode support, and the built-in accelerometer will take care of the switching for you. That being said, Apple is known to be a strong supporter of HTML5, and there's no doubt that the Apple iPad is part of the company's effort to get Web developers moving in the right direction in that regard. There's no Flash or Silverlight support at the time of writing here. The Apple iPad offers a very nice presentation layout, and a large on-board QWERTY keyboard will appear when you need to enter text. Will the iPad beat a laptop keyboard? The iPad Keyboard Dock will be available as an accessory, offering a full-size traditional keyboard for those who need that. Apple's way of presenting photos is already highly acclaimed. Especially taking flick scrolling to this new level where it can be combined with a larger screen real estate, should really give you the feeling of an "iPhone on steroids". We're sure it's going to be a whole lot easier to bring out old memories when friends comes to visit after the Apple iPad hits store shelves than before. Showing photos on a laptop is fine, but the Apple iPad will basically act like an advanced photo frame in that regard. There's likely no smartphone or laptop that'll be able to beat that experience. Videos on the Apple iPad will obviously be a challenge when it comes to power. With built-in access to the iTunes store, as well as YouTube and YouTube HD streaming being available, it'll be easy to throw your smartphone or laptop away in favor of the Apple iPad. You can play movies, TV shows and music videos. When it comes to music playback, we guess playing those music videos will be the most alluring part here, as the iPad would obviously not beat the iPhone when it comes to portability and battery life. A large part of the iPhone apps out there are games and the Apple iPad will run any iPhone app out-of-box without modifications. To take advantage of the iPad's large screen, one can also double the pixels on-the-fly and run apps in full screen mode. Popular iPhone developers will offer optimized iPad apps pretty quickly to take full advantage of the larger screen though, and an Apple iPad Developer SDK was released today to ensure that every developer out there can offer optimized iPad apps. The app store will be an integral part of the iPad. Some high-def games will be available from companies such as Electronics Arts from day one. EA's Need for Speed Shift will for instance offer a range of new touch controls besides taking advantage of the obvious graphics power and display technology hidden in the Apple iPad. 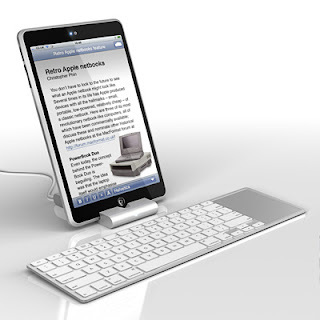 Of course, eReaders will never look the same after you've seen what type of content the Apple iPad can offer. New York Times have created a showcase of its newspaper, which will for sure become a popular service on the iPad. In stead of holding a static newspaper in front of you, you can simply load up New York Times on the iPad, boasting multimedia such as in-line video streaming. Yes, you read that right. It's that simple to reinvigorate newspapers, as long as you have the world's largest gadget maker enabling it, of course. If you're an independent sketch artist, Apple will of course also provide you with an application called Brushes. We guess its potential is self-explanatory. There's also a new iBook Store, which will basically compete directly with certain other eBook stores out there. Apple has partnered up with Penguin, HarperCollins, Simon & Schuster, Macmillan and Hachette Book Group, and eBooks will be available in the ePub format. Steve Jobs has also pushed his army to create iWorks for Apple iPad, and will sell it for $10 each (Pages, Numbers and Keynote). A calendar for scheduling is also available out-of-box. The Apple iPad is 0.5 inches thick (just as slim as the iPhone) and weighs in at 1.5 pounds. It sports a 9.7-inch IPS display and offers "full capacitive multi-touch". Compared to TFT displays, IPS displays require a brighter backlight, subsequently drawing more power. In return, Apple iPad users will get a wider viewing angle (178 degrees to be exact) and accurate color reproduction. The Apple iPad is the first consumer device to take advantage of an IPS display (LG.Philips is likely the brain behind this screen). The Apple iPad will be available in 16GB, 32GB and 64GB versions. It also boasts 3G, Wi-Fi 802.11n and Bluetooth 2.1 + EDR connectivity, speaker, microphone and an Apple 30-pin port. Apple promises a battery life of up to 10 hours and over a month of standby time. The bomb shell as far as specifications is concerned: The 1GHz Apple A4 chip. It's an ARM SoC with an integrated graphics processing unit (GPU) manufactured by P.A. Semi. Apple acquired P.A. Semi back in April 2008, and this is the first Apple chip to appear. We guess it's just a matter of time before Apple's iPhone will be powered by an Apple chip as well. In other words, companies like Qualcomm and Intel doesn't seem to get much fun out of Apple's new mobile adventure in the future. The Apple iPad Wi-Fi models will start shipping worldwide in late March 2010 ($500 for 16GB version, $600 for 32GB, and $700 for 64GB). The Apple iPad 3G models will start shipping in the U.S. and selected countries in April 2010 ($630 for 16GB version, $730 for 32GB, and $830 for 64GB). International pricing and worldwide availability will be announced at a later date. Apple expects to have international carrier deals ready by June 2010. The Apple iPad 3G models (7.2Mbps HSDPA) will be sold with an unlocked micro SIM card, but Apple has a new prepaid data plan deal with AT&T Wireless: $30 per month for unlimited data or $15 per month for up to 250MB. AT&T Wi-Fi hotspots will be free to use when signing up for a data plan with AT&T. There's no contract and you can cancel it at anytime. The AT&T plans can also be activated on the Apple iPad.